Set oven control to broil. Spray broiler pan rack with cooking spray. Place salmon, skin side down, on rack in broiler pan. 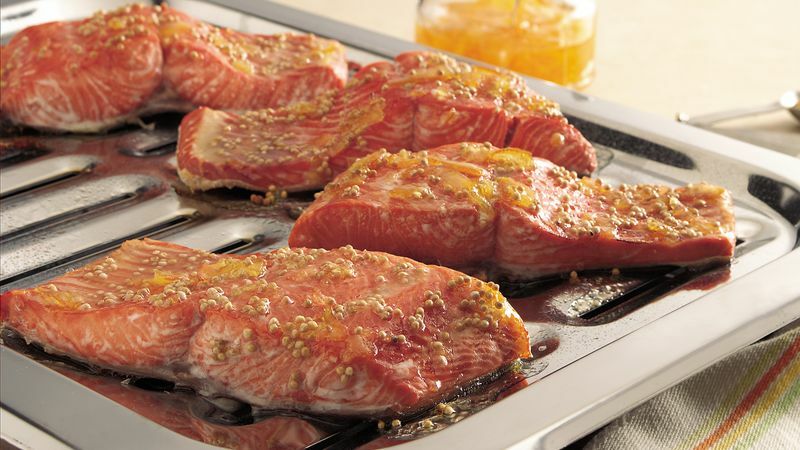 Broil with tops 4 inches from heat 10 to 15 minutes or until fish flakes easily with fork. Meanwhile, in small bowl, mix remaining ingredients. Spread on salmon during last 5 minutes of broiling. Salmon contains omega-3 fatty acids, a fat that has heart-protective benefits. Though it's important to keep the overall fat in your diet low, omega-3 is one you want to eat more of, as it contributes to good heart health.